an SSL-authenticated Internet connection to the APRS-IS backbone. an inter-process TCP socket connection for receiving arbitrary APRS messages from other applications for relay to the APRS networks. a LAN connection to an Outernet satellite receiver for specifically-routed APRS packets. Plugin extensions to YAAC may add other port types. The tab displays a table of currently configured ports, and has buttons to add new ports, modify the settings of existing ports, or remove ports. To add a new port, click the Add button, then set the appropriate options in the displayed port editor dialog and click OK.
To modify an existing port, select the appropriate row in the table of existing ports and click the Edit button. 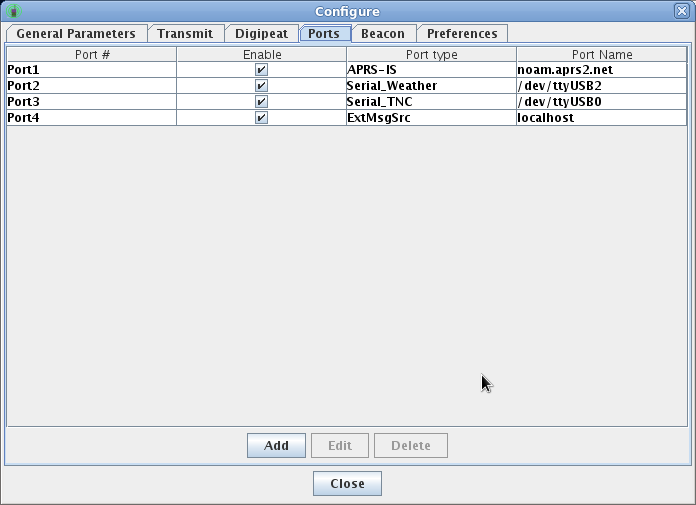 The port editor dialog will be displayed with the current settings of the port. To stop using a port, select the appropriate row in the table of existing ports and click the Delete button. The top item in the port editor dialog specifies the type of port. The remaining items change, depending on the selected port type.